If you have a Fire TV Stick or a 4K Fire TV, you have no idea who much more you’ll enjoy it once you pick up the brand new version of our favorite Fire TV accessory. The iPazzPort Mini Bluetooth Keyboard with Backlight has been a favorite of ours for a long time, but it just got an update for 2018 and it’s better in several ways. The design and build are better and so is the backlighting, but the real story here is the addition of eight new buttons on one end of the keyboard. Using this new model, you can finally — FINALLY — control your TV in addition to your Fire TV! Say goodbye to having to use two different remotes. It’s an awesome upgrade, and it’s 20% off right now thanks to an on-site coupon you can clip. 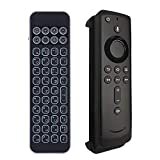 [ IR Learning Functions ]-Bluetooth mini keyboard with IR learning buttons for Fire Stick and New Fire TV. Make the type and search much easier, control the basic functions of your tv(Power、Source、Volume+-、Right and left), all in one remote control.Search “iPazzPortfans” on youtube to get video tutorials..